After the hustle and bustle of a day shopping or taking in the sights and atmosphere of New York City, the numerous rooftop bars offer the full range of entertainment from dancing to dining to simply sipping a cocktail and watching the sun go down and the lights come up on the City that Never Sleeps. Rooftop bars offer the perfect combination of sightseeing and relaxing, making them the perfect cool-down and relaxation spot for holidaymakers. 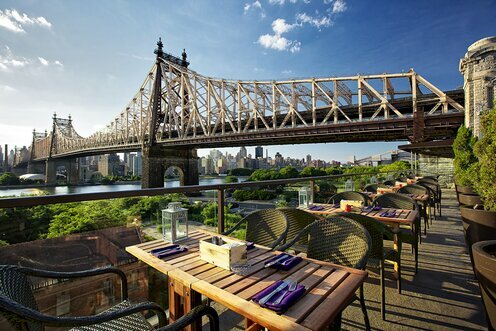 New York is one of the most exciting travel destinations in the world, and the unique skyline views from the decks of these exotic rooftop bars can make the trip even more memorable; here are five of the best. 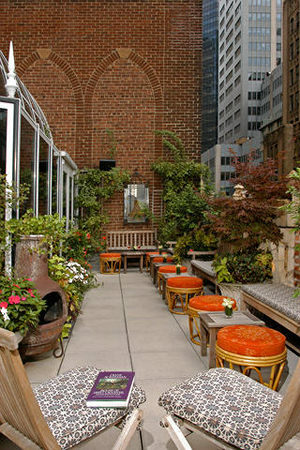 Nestled in the heart of the Chelsea Flower District, the Hotel Indigo has a well-earned reputation for simple elegance; that reputation is borne out by the sleek, intimate atmosphere of its rooftop Glass Bar. The unique lighting, spectacular view and elegant décor combine to create the perfect setting for drinks, appetisers, and dancing under the stars after a day steeped in the glamour of New York. Even in inclement weather travellers can enjoy this rooftop gem, since it features a waterproof enclosure for all-year-round comfort and luxury. New York represents a fusion of many different cultures; nowhere is this more evident than in the Asian-inspired styling of the glamorous Salon de Ning. Bold reds, oranges, and shades of black dominate the colour scheme in this upscale rooftop bar, which takes its name and inspiration from world traveller and Shanghai social butterfly Madame Ning. Patrons enjoy stunning views of the lights of Fifth Avenue while sipping a Ning Sling and relaxing in comfort on the outdoor terraces or inside at the well-appointed bar and salon. Drinks, dancing, and an extensive dinner menu are the perfect accompaniments to the stunning panoramic views that constitute the main attractions at the Penthouse 808 nightclub and bar. The retractable glass greenhouse allows this rooftop getaway to remain comfortable all year around, while the view of Manhattan from the terrace is especially lovely at sunset. Integrating a blend of European chic with South Beach sensibility, the Ava Lounge is definitely Miami Nice; the rooftop oasis provides unparalleled views of the iconic Times Square and the Hudson River, making it an exquisite choice for travellers from all around the world. 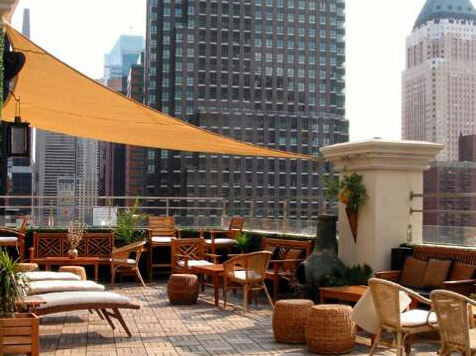 The upscale casual atmosphere of the Ava Lounge make it one rooftop bar experience not to be missed. 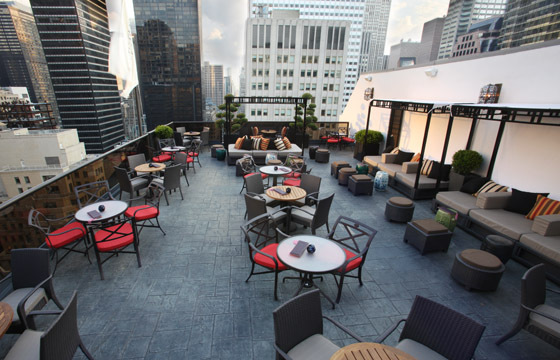 For an intimate night out or a quiet retreat, the Bookmarks rooftop bar offers quiet charm and European-style cocktail service. What Bookmarks lacks in panoramic views it makes up for in simple rustic charm and natural brick and tile décor, making it the perfect spot for romantic encounters or stimulating conversation and a lovely place to wind down after a day of sightseeing and shopping. New York is a vibrant cosmopolitan city with unique attractions including the glitz and glamour of Broadway shows, the extensive shopping and fashion district, Times Square, the Empire State Building, and many other landmarks and once-in-a-lifetime sights. 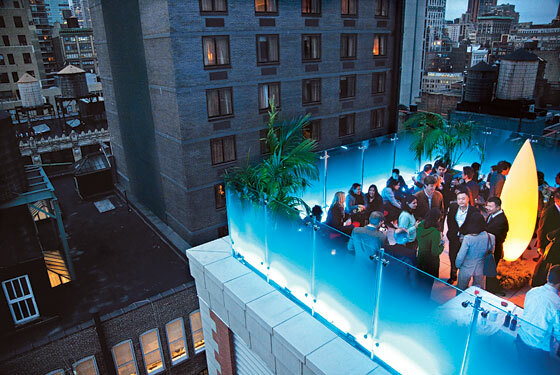 A trip to New York can create memories that will last a lifetime; including one or more of the luxurious rooftop bars on the itinerary can make the holiday even more memorable and enjoyable. This post was written by Nadine Hallak, travel expert at flight deals website www.cheapflights.co.uk, with thanks to the respective hotels for providing the exceptional photos.